We also have a large number of written and video testimonials from past customers that will explain how great our system is at removing all types of flooring dust free. Please Watch Saltillo Tile Floor Being Removed in the Video Below dust free with the homeowner standing watching! We are licensed, bonded and we are also insured for both personal liability and workers compensation. Before hiring any company to remove your floors, please request to see their license, bond and insurance information as unlicensed contractors cannot perform flooring removal jobs over $1,000, if they do, it is a class 1 misdemeanor. Call us TODAY for your removal project: (480) 418-1635 or if you have questions regarding licensed contractors in the state of Arizona. Here is a video showing the possible dangers of using a ride on floor scraper in a residential home or business. This method of removal, though fine if it was an empty warehouse, is not the best way to remove tile from a residential home. The video shows what we discovered when we went to a home where such a machine was used. The homeowner wanted to put in engineered wood flooring, but the floor was a mess, see how much damage the company caused to their floor. If you are planning to do stained concrete or wood floors, even perhaps a large format tile, you could need additional work if a ride on machine is used, and that is why we don’t use them. Click the map on the left to see if there is a Certified DustRam System Tile Removal Company in your area. Here is a video showing how we remove thinset dust free! Thinset is that glue that bonds to your concrete. For some homeowners who have already removed tile, we offer a dust free thinset removal service that will get them back down to bare concrete in very little time. Depending on the type of thinset you have, we can sometimes remove over 2,000 square feet of thinset in a day. When removing the thinset, it’s usually a VERY dirty & dusty job, if you watch the video below this one, you will see what dusty removal looks is. Here is our page for thinset removal. This photo on the left was taken while the thinset was being removed from the concrete, the final stage in our dustless removal. When we are removing ceramic tile or other flooring materials, we use no plastic for dust control, no water and GUARANTEE your home will be as clean or cleaner when we leave than when we arrived! If a company will not show videos of their workers removing these types of flooring, you should be cautious and make sure they are licensed, bonded and insured and have an active license that has not been suspended. If you still have questions, we can always have a discussion with you on the phone or even come out to give you an onsite estimate. We are Arizona Home Floors, the ONLY company in the Phoenix area which offers a truly DUST FREE Phoenix tile removal service. Check out our videos page and see why we provide the best service for removing floors in Arizona. 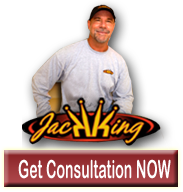 Our owner, Jack King, is the inventor and patent holder of the revolutionary DustRam® System of Tile & Floor Removal Tools & Equipment introduced to the flooring industry nationwide and other companies today. Our specialized equipment consists of technologically advanced dust free tile tools for every step of the process and high performance, high powered vacuums that capture the dust at the source. The tools that remove the flooring and the methods we have developed ensure dust never has a chance to become airborne and contaminate your home. If you are looking for an exceptionally clean tile flooring removal, with all of the ceramic tiles, porcelain tiles, Saltillo tiles, travertine, stone, thin set, mortar, grout and all the dust gone, call us today about your project. We also offer other services for materials like stone, wood, vinyl, and even carpet in the Metropolitan Phoenix and surrounding areas of Scottsdale, Chandler, Gilbert, Peoria, Glendale, Ahwatukee, Sun City and beyond. Our website is here to educate you about important aspects of the removing process and introduce you to DustRam® System Equipment that protects you, your family and your home during this potentially messy and hazardous process. What Is DustRam® System Tile Floor Removing Equipment? Our proprietary patented DustRam® System is specially developed, military-grade equipment, rugged and versatile enough to remove any type of flooring without any dust. The system consists of 6 patented & patent-pending devices that capture and contain the dust at the source, as it is created and during every step of the removal. Each tool is attached to a self-cleaning, triple HEPA filter vacuum now required by OSHA to perform tile concrete floor projects. This technologically advanced floor tool not only eliminates dust from becoming airborne, it also allows us to remove the ceramic tile and other flooring more quickly and efficiently. Above is a recent video comparing the DustRam® System and a competitor’s system called the Dust Commander®. Notice how our patented DustRam® System can easily reach below the toe kick area of a wooden cabinet. To give you some ideas of the speed and efficiency of this process, most flooring removal projects are completed in just 1 day! Our process is so clean, no plastic sheeting, tape or water is required to protect your home from dust. Your indoor air quality does not change even as tile and thinset are being removed at unbelievable speeds. Flooring can be removed from closets with clothing still hanging in them and from pantries with food still on the shelves. There is no need to move out of your home, pay for multiple visits from a commercial cleaning service, or put off the removal of your floors any longer. We GUARANTEE IN WRITING your home will be cleaner when we leave than it was when we arrived. Call to book with us now: (480) 418-1635 we are here from 7:00 AM until 4:00 PM Monday through Friday. Above is a video showing how we remove wood flooring dust free. Why Use Contractors With DustRam® System For the Removal of Floor Tile? The DustRam® System was designed for contractors whose customers are concerned about the danger of exposure to the vast amount of dust created during traditional floor extraction methods and maintaining the cleanliness of their home. Outdated tools, floor scrapers and floor removing methods create so much dust, it can take months (or longer!) to remove most of it from your home. Our dustless removal of tile flooring process protects you, your family, your home and your belongings from dust contamination during the removal process. Only the DustRam® System provides a clean, healthy, and environmentally friendly way to remove the tile and other flooring. This information will help you decide if we are the right contractor with the best equipment to work with you. Please take a minute to read our FAQ’s, BBB certified local reviews and other Reviews. Our service is advertised to the discriminating Homeowner in home improvement publications like TheHomeMag and House 2 Home Showcase. You may also read why a home inspector calls the DustRam® Equipment System a “work of genius” and the reasons why a very particular Homeowner chose the DustRam® Service. For many additional informational videos, please feel free to visit our Arizona Home Floors YouTube Channel. The video above demonstrates some of our tile removal equipment and services in action. Watch to see how quickly and efficiently our equipment and operators work, while leaving your home free of dust and debris! Please be on the alert for false advertising, misrepresented claims, poorly fabricated imitations of our products, and use of various terms similar to dust free, dustless, low dust, virtually dust free, no dust, clean tile demolition or other scams that do not deliver what is promised. Contractors and companies without the DustRam® System Equipment lack our patented, state-of-the-art removal equipment, specialized training, and expertise. Even if a company claims their service is 98% free of dust, that means if your removal produces 500 lbs of dust (about 500 sq. ft. of tile), then the 2% left behind is equal to 10 lbs of dust that will contaminate and circulate throughout your home! Be sure to verify any claims of what results you can expect from any company claiming to provide clean or virtually dust-free tile removal by checking their reviews, asking for references, and check if their license is current, suspended or previously revoked under a different business name. Investigate further any customer complaints which may have been filed with the Arizona Registrar of Contractors. The DustRam® System Equipment Reduces Floor Preparation! See the mottling effect in the picture to the right? Most concrete floors have minor imperfections on the subfloor surface. Our patented process of thinset removal makes concrete floors smoother, flatter and closer to being installation ready. During the thinset removing process, our DustRam® grinding tools reduce or minimize high spots in your concrete or tile cement board – resulting in dramatically flatter subfloors. Some contracting companies use powerful hammer drills incorrectly during ceramic tile concrete removal which severely damages the surface of your concrete subfloor and incurs additional unanticipated repair costs. With our DustRam® System, your subfloor is typically better prepared for the next installation of new ceramic tile, stone, hardwood, laminate or any other flooring you select. If you or your installer believe there is a hump in your floor that needs to be ground down to install your new flooring, it could actually be a low spot in the subfloor that creates the illusion of a hump. We recommend you watch the short videos on our leveling page to see why using a 5′, 6′, or 8′ straight-edge can be incredibly inaccurate for properly determining the flatness of your floor. High or low spots are best identified by using multiple straight-edges of at least a 10′ or longer length. The Arizona Home Floors scientifically developed and proven methods can flatten concrete inside occupied residential homes to an incredible 1/16-inch in 50 linear feet, well above Industry Standards. For additional videos and information on this amazing technique, please visit our Arizona Home Floors YouTube Channel. All DustRam® System Contractors are required to attend 3 Days of Hands-On job site training to learn the processes and proper use of the equipment before it is shipped to them for use in their business. All of our experienced, highly trained, and courteous crew members have passed a drug test & background check, are United States citizens and speak fluent English. Customer reviews frequently mention the hard work, dedication and outstanding Customer Service everyone from our office to job site staff consistently provides to our valued clients. To learn more about our services, or to arrange a Personal Consultation in your home, please call us at: (480) 418-1635 or E-mail us today. Our Estimate Fee is fully refundable if you choose to use our services for your remodel project. If you live outside the state of Arizona, Find An Authorized DustRam System Floor Removal Contractor In Your State Here. Choose AZ Home Floors for your floor tile removal Phoenix project. In the above video, the DustRam® is perfect on walls and fireplaces for prying against larger pieces of stone, breaking them free of the mortar. Below is another video showing the removal of travertine flooring and risers. A difficult and quite technical job, but the DustRam® System just works better. Dust Free Tile Removal in the following areas: Anthem. Avondale, Buckeye, Carefree, Cave Creek, Chandler, Fountain Hills, Gilbert, Glendale, Gold Canyon, Goodyear, Litchfield Park, Mesa, New River, Paradise Valley, Peoria, Phoenix, Queen Creek, San Tan, San Tan Valley, Scottsdale, Sun City, Sun City West, Sun Lakes, Surprise, Tempe, Tolleson & Tucson. Arizona Revised Statutes, Title 32, Chapter 10 requires a contractor be licensed through the Registrar of Contractors (ROC) to legally perform construction or home repair and remodeling jobs having total project cost, including labor and materials, above $1,000 or requiring a building permit, which is why you, as the homeowner, should personally verify that the contractor has a current license. According to the Arizona Registrar of Contractors, an unlicensed contractor can endanger the health, safety and welfare of the public, which is why you would want to have a licensed company such as Arizona Home Floors performing your removal project. We use contracts, we show up on time and we will leave your home as clean, if not cleaner, when we leave than when we arrive.